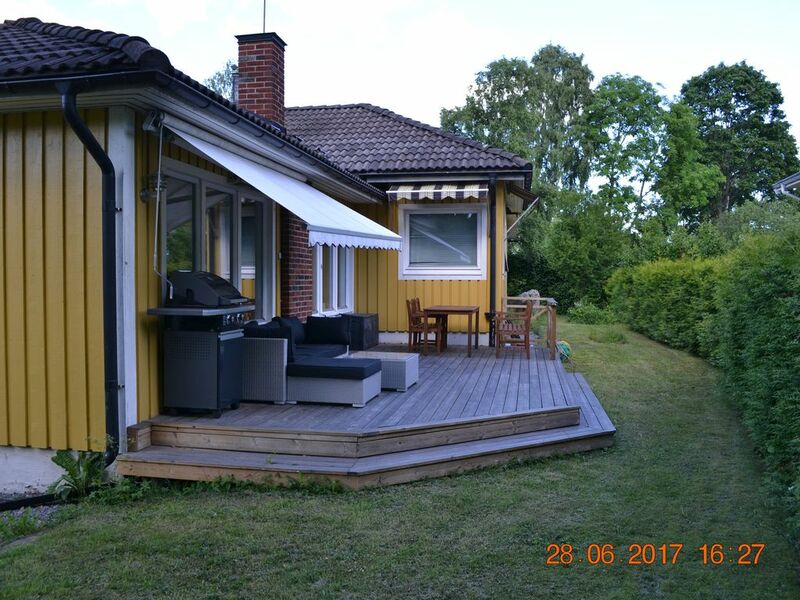 The house is situated 20 minutes from the Arlanda airport and 15 minutes from Stockholm central station by commuter train. 3 minutes walk and you are at Häggviks commuter train station. You will find a big shopping mall 5 minutes walk from the house. The house have a nice garden with privacy and a wonderful veranda. The are 2 twin bedrooms on the ground level and a nice Tv room in the basement with a sofa that can be folded out to a sleep for 2 persons. Extra beds are available. The living room upstairs are big and is heading the veranda and the garden. The veranda is summertime furnished with a rotting sofa and tables/chairs. In the back garden there is heated a spa-pool. A lake were you can swim and a forest if you want to go for a run is close by and within walking distance. This is a very pleasant home and a very good host. We had been concerned about being so far from downtown Stockholm but the train into Stockholm center was very convenient. A short walk to the station and the trains were fast and frequent. That train line also runs out to Uppsala for an easy day trip to a beautiful city. Joe Patton and his family were very nice and commicative and I would with no doubt recomend them to other hosts that rent out their homes. They took care of our home very well and they left the house very cleaned. The hospitality was very good, the owner (Ulf) was very nice and helpful. The house had a very good location and we had easy access to Stockholm and other places. Ulf gave us a great advice by telling us about a week ticket with which you could use all types of public transport in Stockholm. Over all we enjoyed a great visit and the house and the owner played a big part in it. I had the pleasure to meet Siegfried and his nice family and they seemed to enjou the stay. The took care of the house very well and left it very clean and I would with no hesitation recommend them to other landlords.